This is setup options for Shell send method (also known as "mailto: protocol"; esmShellClient). They are located at Sending tab. 1. 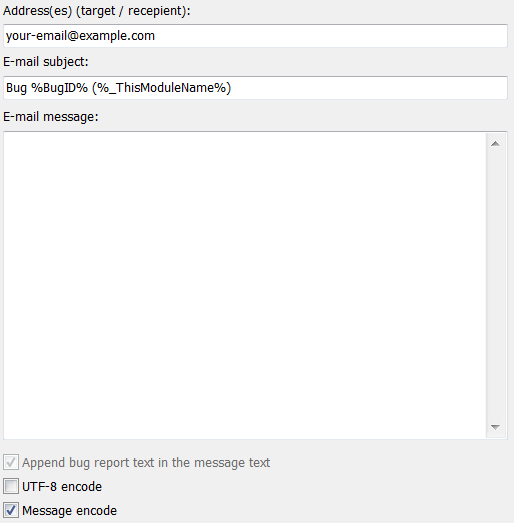 "Address(es)" (.SendShellTarget) option specifies target e-mail address to send bug report to. Specify here your e-mail address for bug reports harvesting. Multiple e-mail addresses are allowed (separate them with "," or ";"), but this is usually not a good idea, since not every e-mail client software support this. 2. "E-mail subject" (.SendShellSubject) option specifies header (subject) for all sent bug reports. You can specify generic static text here (like 'Bug report for Project X') or use a %tag% to generate dynamic subject to distinguish one bug report from another. See using variables for more info. 3. 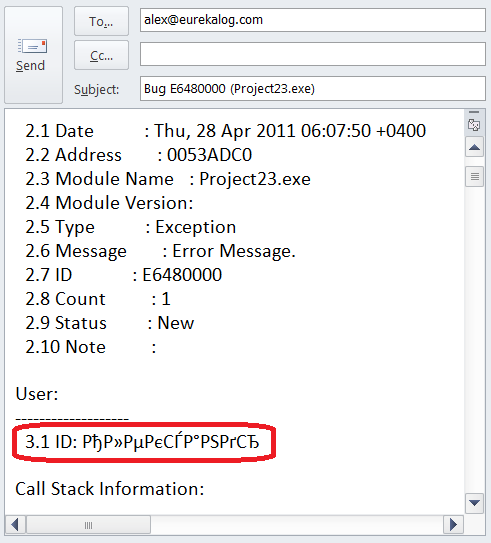 "E-mail message" (.SendShellMessage) option is optional text of e-mail message (body). You can enter here any text, use variables or just leave this field empty. Bug report text will appear here automatically. 4. 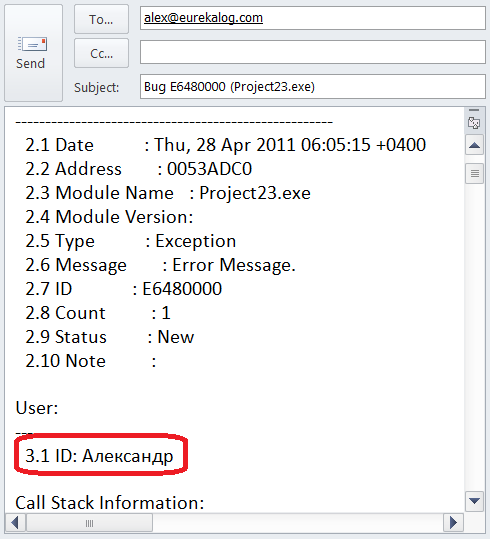 "Append bug report text in the message text" option appends bug report text to the e-mail message (body). If e-mail body is empty - e-mail will consist of bug report text only. If you've entered non-null text - the first will be your text, the next will be bug report text. This option is always checked for Shell send method, you can't turn it off - because this send method doesn't support attaching files, so there is no other way to send bug report, except inserting it into message. 5. "Use ShellExecuteEx" (.SendShellUseShellExecute) option defines which method should application use to run mailto links. Checked: use ShellExecuteEx function to open mailto link. Unchecked: use CreateProcess function to open mailto link. ShellExecuteEx is restricted to INTERNET_MAX_URL_LENGTH (about 2048) characters. CreateProcess is restricted to 32'767 characters. However, when using CreateProcess function - application must manually resolve mailto protocol registration to obtain executable of mail application. This may or may not be the same application as used by ShellExecuteEx function. Check this option to get maximum compatibility. Uncheck this option to get maximum information length. Note: enabling "UTF-8" option may decrease limit on maximum e-mail length due to multi-byte character encoding. 7. "Message encode" (.SendShellEncode) option enables %-encoding for some characters, as required by mailto protocol specification. 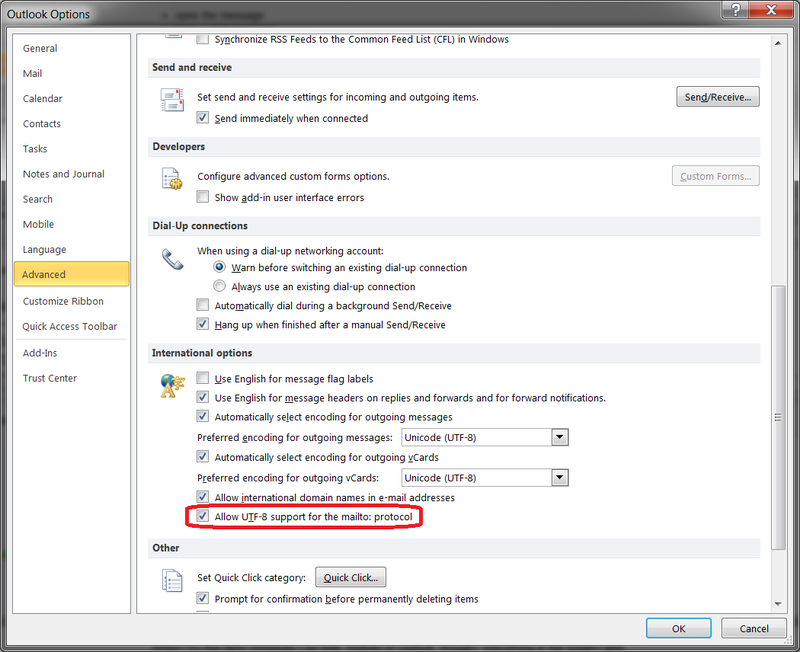 You can uncheck this option, if you have some problems with e-mail clients. • "Message encode" is off: "mailto:example@example.com&subject=Hello World"
• "Message encode" is on: "mailto:example@example.com&subject=Hello%20World"